Objective statement: Describe the type of position you are looking for. Skills: Describe some of your key skills and abilities. There are so many different skills involved in nursing that you can’t list all of them. Summarize your abilities in 3-5 different categories or functional skill sets focusing on those that relate to the position you are applying for. Employment history: List all previous nursing employment, and a summary of what your duties were in each job. Be specific to your line ofwork such as ICU, pediatrics, clinic work etc. To write your resume gather all the information to be included and using a RN resume template or a RN resume sample as a guide, work your way through each section of your resume. There are many online sites where you can find a sample resume for registered nurse to use as a guide. You can use the job criteria of the position you are applying for to target your resume to that specific job by focusing on key words and required skills you have that match the job criteria. 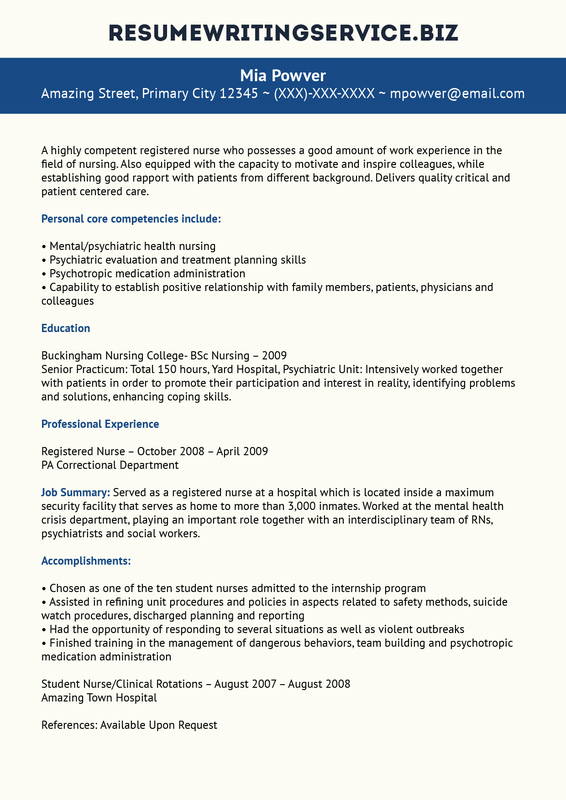 You might be also interested in our nursing department head resume sample kindly provided by our experts. Is the format pleasing to the eye and easy to read with a good balance of white space and text? Does the resume fit well on the page, as opposed to appearing cramped together or not full? Does the resume utilize bullets and avoid paragraphs and long sentences? Does the resume use bold, italics or underlining to highlight your most important information? Do the included items support your overall goal or objective statement? Is it easy to see how you meet specific job requirements/qualifications? Proofread your resume using a checklist will help you write a good resume that is easy to scan so that employers can quickly to that you possess the requirements they are looking for. There are approximately 2.8 million registered nurses working in the U.S. with around 63 percent of them working in a hospital environment. The annual mean wage for a RN is $69,790 or $33.55 per hour. Employment of registered nurses is projected to grow 16 percent from 2014 to 2024, which is considerably faster than the average for all occupations. Looking for more samples? A nursing student resume might be what you need! If you need help with your RN resume, our experts can help you 24/7!